Thousands of them were captured and sold as "penny turtles" in pet shops. With its punky green hairstyle, chin spikes and unique underwater abilities, the Mary River turtle is a true original — but it might not be around for much longer. The unique freshwater turtle holds the 29th spot on the Zoological Society of London (ZSL)’s new list of the world’s most vulnerable reptiles, and has been categorized as endangered on the IUCN Red List since the 1990s. The freshwater turtle’s green mohawk, which gives it a Troll doll-like appearance, is the result of algae growing on its head while submerged for extended periods. Sadly, the docile turtle’s ability to hide underwater did not protect him from the Australian pet trade. From 1962 and 1974, people legally raided the turtle’s terrestrial nesting sites and sold 15,000 hatchlings a year to pet shops around the country — nearly wiping out an entire generation. This is especially unfortunate for a turtle who takes his sweet time growing up. Female Mary River turtles reach sexual maturity around the age of 25, while males wait 30 years to reproduce. The creation of dams, flooding and loss of nesting sites have also contributed to the turtle’s dwindling population. Unfortunately, these ancient shelled creatures are often overlooked when it comes to protection and popularity. 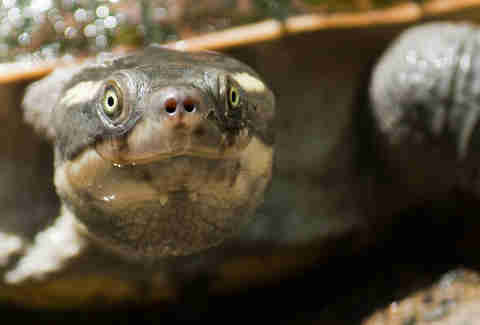 This fella, the Mary River Turtle, has been added to the #endangered species list. 😥 Most turtles breathe through their bum, but this #punk look comes from the #algae that grows over its body. Besides raising public awareness, much can be done on a personal scale to help. Liu notes that simply reducing plastic and water use and eating less meat is beneficial to all animals — not just turtles and tortoises. Conservation efforts are underway to protect the rare river turtle’s nesting sites so that these striking reptiles have a chance of survival, and can delight those who are lucky enough to spot them for many years to come. To help the Mary River turtle, you can make a donation to the Australian Geographic Society to protect nesting sites and increase the hatchling population along the Mary River.